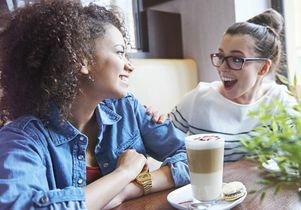 Hearing other people laugh together, even for just one second, can be enough information to gauge whether or not those people are friends, according to a UCLA study. The research, co-authored by Greg Bryant, a UCLA professor of communication studies, was published today in the Proceedings of the National Academy of Sciences. It found that the phenomenon holds true in societies around the world — and that when people hear two females laughing together, they are highly likely to assume the women are friends, even when they are not. Bryant and 32 collaborators across the globe, including Daniel Fessler, a UCLA professor of anthropology, and Riccardo Fusaroli, an assistant professor at the Interacting Minds Center of Aarhus University in Denmark, were interested in better understanding the communicative functions of co-laughter. They played 48 short audio clips of two people laughing together for 966 listeners from 24 different societies. The listeners included people from hunter-gatherer and other traditional small-scale populations, working-class urban groups, and college students. The laughter was recorded during conversations between pairs of undergraduate students at UC Santa Cruz — some who were friends and some who were recently acquainted strangers. Recordings captured the simultaneous laughter of two women, two men, and a woman and man together. Overall, listeners from every society could correctly identify whether the people they were hearing were friends or strangers 61 percent of the time. The scenario in which listeners were best able to judge the relationship correctly was when two women friends were laughing together — listeners were accurate more than 80 percent of the time.